We're starting off our favorite blooming beautiful bouquets with some ravishing red inspiration. Loving the soft and carefree look of this bouquet captured by Michael and Anna Costa. Cascade bouquets don't have to have intense waterfalls of flowers, sometimes just a few tendrils does the trick better. This beauty was created by Statice Flowers and captured by Lime Green Photography. Deep reds with accents of deep purple make for a lovely jewel toned creation. Rachel A Clingen is to thank for this piece of eye candy, captured by Samantha Erin Photography. Ruby red and ridiculously gorgeous, such a good way to use tulips in your floral mix, captured by Brittany Lauren Photography. Amaranthus is a beautiful floral choice for a cascade bouquet, and as you can see it comes in a gorgeous shade of deep red. This beauty was created by Root Design and photographed by Andreea Alexandroni Photography. Loving this fun fruity creation full of apples and berries that beautifully compliment the flowers. Such a sweet idea created by Moss Wedding and Events and captured by Nikole Ramsay. Wake up and smell the roses! This gorgeous bouquet created by Dandie Andie and captured by Blue Colibri reminds us of a sunrise, see the wedding it belongs to here. Next up is our dreamy pink palette of bouquets. This sweetheart bouquet is perfectly pretty, created by Kristal Sawatzke and captured by Lavender and Twine. See the wedding it belongs to here. Looking for a non obtrusive way to add gold to your bouquet? Wrap the stems with gold ribbon and make them sparkle! This lovely piece was created by Poppy Love and captured by Ruth Eileen Photography. See the wedding it belongs to here. Succulents and pink peony's? Can you say va-va-voom!? These beautiful blooms were arranged by Amy Lynne Originals and captured by Nancy Ray Photography. See this dazzling wedding here. We are head over heels in love with this bouquet! Perfectly pastel and versatile for anything from whimsical to elegant. Created by Bare Root Flora and captured by Laura Murray Photography. You can see the wedding it belongs to here. Want to cut back on color? Just add a few accent blooms for that pop. Love, love, love this dainty bouquet created by Kio Kreations and captured by Hazelton Photography. See the wedding it belongs to here. This soft blush and peach bouquet is oh so adorable! A sweet and simple style that has stolen our hearts, created by Going Lovely and captured by Kirsten Julia Photography. See the wedding it belong to here. This beauty of a bouquet, created by Sachi Rose and captured by Mikkel Paige Photography, seems like it has a little bit of everything! On to some outrageously orange bouquets! Can't get enough of those ribbons! This lovely thing was created and captured by the very talented Sweet Root Village. Do we spy some ranunculus? Why yes we do! And how cute does it look in that bouquet created by Finch and Thistle and captured by Stephanie Cristalli Photography? This deep orange bouquet seems perfect for fall, complete with some fruits of the earth. This inspiring bouquet was created by Prestige Floral and captured by Rachel Peters Photography. See the wedding it belongs to here. This bouquet completely takes our breath away. It just seems too perfect, created by Lovely Little Details and captured by Stacey Hedman. Loose and free and completely lovely... What more could you want from a bouquet? This looker was created by Rosegolden Flowers and captured by Leslie Hollingsworth Photography. See the bridal shoot this belongs to here. This bouquet sticks to a single type of flower and maybe that is what makes it so charming! Love this idea created by Cedarwood Weddings and captured by Kristyn Hogan Photography. See the wedding it belongs to here. We love those little pops of sunshine that yellow flowers bring to a bouquet. so up next are our delightful yellow bouquets that we just can't help but smile at. This beauty was created by McKenzie Powell and captured by Bryce Covey Photography. See more of her bouquet designs here. Bright yellow calla lilies! Love it! So simple and sweet created by Statue of Design and captured by Reg Campbell. See the wedding it belongs to here. Billy balls are the perfect little accent for a yellow bouquet. Love the softer yellows thrown into the mix as well. Aga Jones Photography captured this bouquet to perfection. Your bouquet color doesn't have to take over the entire thing. This has yellow pops that shine through amongst other hues. 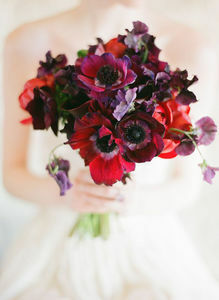 See more bouquet color palette ideas here. For this bouquet you'll need 50% yellow flowers, 50% greenery, and 100% cuteness! This wonderful creation comes from Mills N Blooms and was captured by Sarah Gawler Photography. Most bouquets have some greenery, but why not make the entire bouquet green! This bouquet of herbs twists tradition and looks lovely doing it, captured by Johnny Jaquez Photography. We are in awe of how much variety there is in this gorgeous green bouquet! So unique and lovely too, created by Brad Austin and captured by Docuvitae. Once again we're in love with the edible aspects of this bouquet created by Last Petal and captured by Kristi Wright Photography. Perfect for any fresh farm wedding. If a full blown green bouquet isn't floating your boat what about this half and half beauty created by Natural Art Flowers and captured by DeRay and Simcoe Photography? We're slowly easing our way into some beautiful blue bouquets that will knock your socks off! The elegant bouquet above was created by Spring Sweet and captured by Ashley Slater Photography. See five more gorgeous bouquet ideas from them here. One of our favorite things about this bouquet captured by Tracy Enoch Photography is all the different sized florals from very large to quite small. Don't be afraid to mix and match! See the wedding this bouquet belongs to here. Snowy blue accents make this bouquet the perfect choice for a winter wedding. Just don't get too chilly holding it! This lovely bouquet was captured by Sylvie Gil Photography. We admit that we're always swooning over succulent creations and this bouquet is no exception, created by Laughin' Gal Floral and captured by Sphynge Photography. See the wedding it belongs to here. Who knew muted blues and purples could look so enchanting together! Probably Cedar and Stone and 1486 Photography since they made the above image come to life. See the wedding it belongs to here. Swooning over this lovely cascading bouquet! The pheasant feathers are just the perfect touch. This dreamy idea was created by Dana Smyl and captured by Precious Pictures Photography. Blue and purple combinations can definitely be magical. Soft and bold all at once, the perfect package, captured by Dawn E Roscoe Photography. This purple kale beauty kicks off our purple bouquet inspirations! There's just something so enticing about bouquets that use more then pretty blooms. This wonderful bouquet was created by Habitat Floral Studio and captured by Cluney Photo. See the wedding it belongs to here. Do you love orchids? So do we! So it's no wonder why the above bouquet is swoon worthy, captured by J. Rawlings Photography. More orchids! But this time there's also so much more and we love it all! Get your purple on with this bouquet captured by Khaki Bedford Photography. Big hydrangea blooms easily make a stunning bouquet that's all too easy to fall in love with. This lovely one is from Elizabeth Anne Designs. If you're looking for those deep purple shades look no further. These perfect shades of plum are quite a sight for sore eyes. These were created by Fleur de V and captured by Katy Gray Photography. See the wedding they belong to here. Protea flowers often make their appearance in more eclectic weddings but we love how elegant they look here with their dark purple centers! These beautiful blooms were captured by Mathieu Photography and Mark Brooke Photography. See the wedding this bouquet belongs to here. Lavender bouquets are lovely and we're quite partial to this one that incorporates little white flowers, as well as some wheat! This bouquet was concocted by Paula Jeans Garden and captured by Paige and Blake Photography. See the wedding it belongs to here. The small purple floral accents go perfectly with the ribbons of purple though the peony's. Classy and beautiful, created by Black Dahlia Design and captured by Kelsey Combe Photography. The strands of feathered greenery add lovely volume and texture to this luscious white bouquet created by Lime Flowers and captured by CJ Williams Photography. Peonies and garden roses, oh my, it's simply stunning. Catch us when we fall for this pale perfection created by Fuscia Designs and captured by Laura Jane Photography. See the wedding it belongs to here. Want some brown additions to your wedding bouquet without including dead flowers? Here's some ideas, the first of which is wrap the stems with brown ribbons, branches, or vines! This lovely bouquet was captured by Jaimee Morse Photography. Cotton makes a comeback! Add some brown with dried seed pods and cotton stems. Love this look captured by White Rabbit Studios. See the wedding it belongs to here. Burlap accents are definitely a rustic addition that will add some charm to your bouquet. Captured by Michael Radford Photography. Black isn't the most common wedding color out there but if done correctly can look quite classy. This bouquet is our ode to all you ladies and gents who want some black! Created by Bo Boutique and captured by Theresa Furey Photography. See the wedding it belongs to here.